The default emergency protein in my fridge? Perfect hard-boiled eggs. They’re tasty, portable, and packed with great nutrition – what’s not to love? 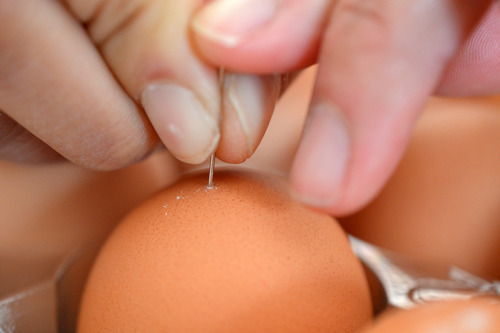 Grab a bunch of large, pastured eggs, and use a pin or thumbtack to poke a hole in the fat “bottom” end of each of the eggs. 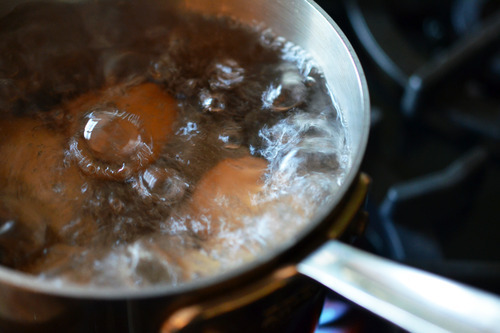 Gently place the eggs in a deep, medium saucepan and fill it with cold water. Make sure the eggs are in a single layer, and at least 1 inch below the surface of the water. 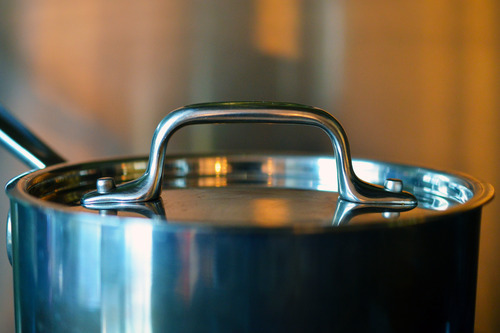 When the minute’s up, take the pot off the heat, cover it with a lid, and let the eggs sit in the hot water for 10 minutes. 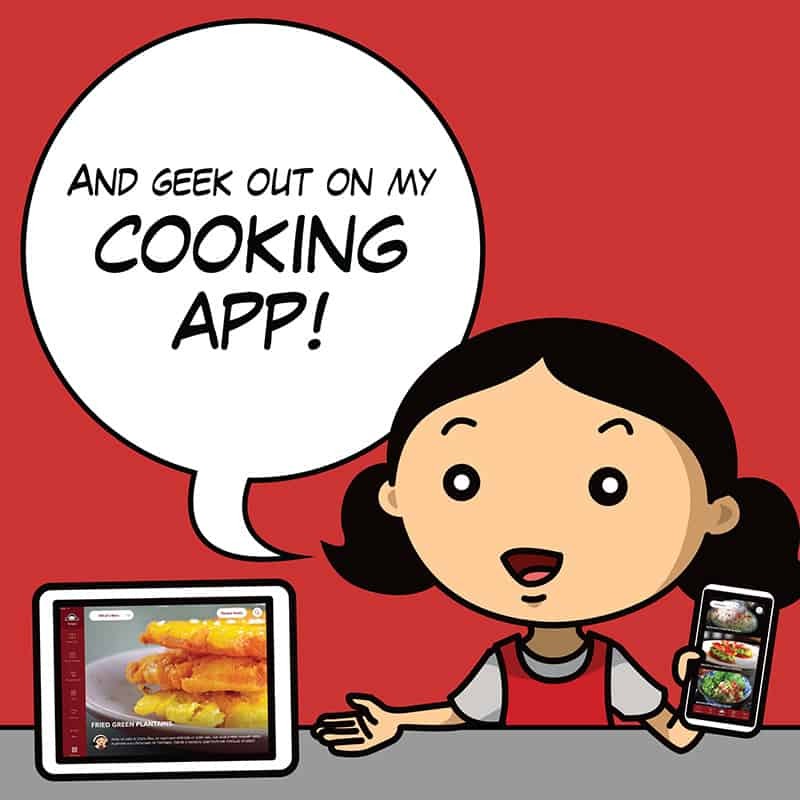 Set a timer – we want to be precise about this! Then, fish the eggs out of the icy water, gently rap them against a hard surface to crack the shells, and peel each egg starting from the bottom end (where you poked the pinhole). 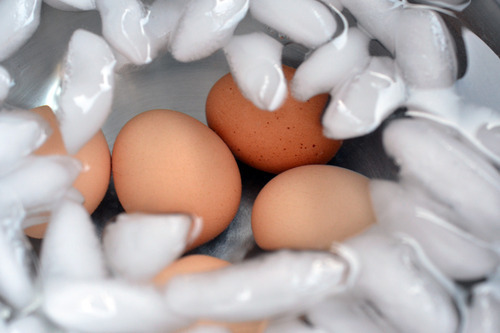 Don’t wait until the eggs are completely cool – they should still be warm to the touch. The shells should come right off, with no fuss or muss. The result: Perfectly cooked eggs, with no ugly gray-green rings around the yolks, no foul odor, and no telltale divots in the whites. If you aren’t eating these eggs right away, store them in the fridge in a sealed container for about a week. What are you waiting for? Boil some eggs! 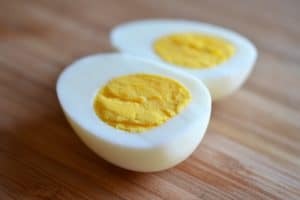 Here’s how to make perfectly-cooked hard-boiled eggs that are never overcooked (I hate the gray-green sulfur ring around overdone yolks) and are easily peeled! 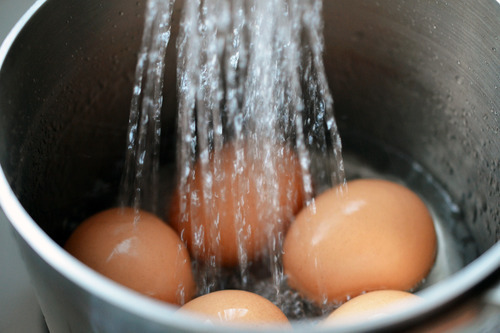 Then, once the timer goes off, remove the eggs from the pot and transfer them to the bowl of ice water. Completely submerge the eggs in the ice water for 5 minutes. Then, fish the eggs out of the icy water, gently rap them against a hard surface to crack the shells, and peel each egg starting from the bottom end (where you poked the pinhole). Don’t wait until the eggs are completely cool – they should still be warm to the touch. The shells should come right off, with no fuss or muss. By the way, you may have heard that super-fresh eggs aren’t the best for hard-boiling ‘cause they’re more difficult to peel; from my experience, that’s true. Try to use eggs that are at least a week old. But if you’re “stuck” with really fresh eggs – poor you! 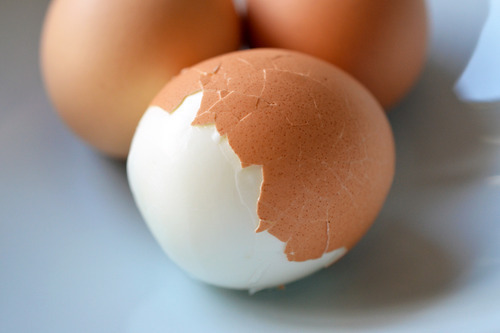 – the techniques I use will still help maximize the peel-ability of your oeufs. 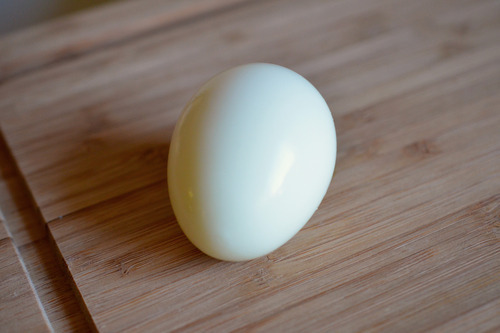 If you have an Instant Pot, follow this method for making hard "boiled" eggs that peel easily!